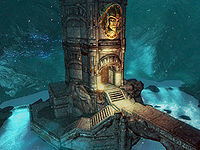 The Tower of Mzark is an abandoned Dwarven tower located in Blackreach. The tower can only be initially accessed from Blackreach. It is situated in the southwestern corner of the cavern, on a spire between two waterfalls. There is a stone bridge over the river which connects to the northern face of the tower. The tower has an exterior, an interior zone, and the surface exterior where the lift is. After crossing over the bridge, you will see a winding set of stairs going down to your left, as well as a door ahead, which leads to a lift that will take you up to the interior of the tower. Proceeding down the flight of stairs, you will come across an unlocked chest to your right, along with two pieces of Dwemer scrap metal—namely a solid Dwemer metal and a bent Dwemer scrap metal. The chest will always contain either a piece of jewelry or an amulet of one of the Nine Divines. Other leveled loot may include more jewelry, gems, soul gems, and/or scrolls. Continuing down the flight of stairs further, you will reach the southern face of the tower with stone arches and a Dwemer pipe overhead. There is a crimson nirnroot plant growing among some mushrooms here. If you proceed down the stairs further, you will eventually reach a stone platform raised above the water, between the two waterfalls. Towards the west of the platform is a short flight of stairs going down into the water. Across the water is a Falmer campsite inhabited by three leveled Falmer. 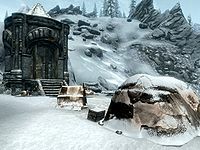 The camp has a Falmer chest, three corundum ore veins, and in the tent at the top of the hill, a Dwemer boss chest. To get to the inside, go back to the door on the northern face of the tower. Open the door and use the lever ahead, which will activate the lift and bring you up to the tower's interior. Upon using the lift, you will arrive in a short corridor leading to a small chamber. After entering the chamber, immediately to your right is a stone chair and three tiers of shelves. There are more than forty ruined books resting on the shelves, as well as two Dwemer gyros, and a random heavy armor helmet. There are also two Dwemer chests resting on the shelves, one of which has a novice-level lock. Directly opposite these shelves in the east corner of the room is another shelf with a random, empty soul gem on it. In the middle of the room, surrounded by more than ten stone benches, there is an extinguished campfire with two pots hanging over it. One pot contains two guaranteed samples of charred skeever hide, while the other pot contains one glowing mushroom. Nearby is an unowned bed roll and a knapsack propped up against an unusable barrel. Moving on ahead and to the far right (west) corner, you will see three stone chairs in front of some tables that are littered with ruined books. Resting on one of the tables is a copy of the Smithing skill book The Armorer's Challenge, as well as one of five random potions—potion of cure disease, of cure poison, of healing, of magicka, or of stamina. To the left of the skill book is a Dwemer shelf with a thistle branch, a bowl of spriggan sap, two pine thrush eggs, and two Dwemer plates. A Dwemer cog rests on top of the shelf. 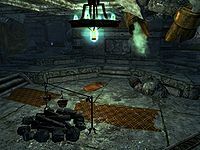 On the opposite side, in the south corner of the room, is a symmetrical set-up of stone chairs, tables, and another Dwemer shelf. The shelf contains more ruined books, two Dwemer cogs, and another chest with a novice-level lock. On the adjacent table you can find an apothecary's satchel. Just beside the satchel are a scroll of candlelight, a scroll of muffle and various items of clutter. There are also a few Dwemer dishes lying around. Resting on the other side of the table with a few more ruined books is a leveled potion of strength. Continuing on through the next door brings you to a short passage with two Dwemer pots by the sides and a closed door at the end. 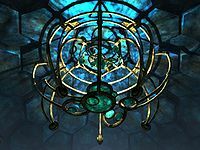 The door leads you to a large circular main chamber which houses the Oculory, a curious device created by the Dwemer for unknown purposes. Enter the chamber and continue to move in a clockwise direction up the winding ramp, eventually reaching the Oculory. This device has numerous focusing lenses and is used during the related quest Elder Knowledge to acquire an Elder Scroll. Controls for the device are located on a raised podium with several buttons and a receptacle for placing a Blank Lexicon. Behind the controls, along the back wall of the main chamber, is a Dwemer shelf with five Dwemer cogs piled up next to it. This is especially helpful to the Dragonborn during the first part of the quest Arniel's Endeavor. Directly below the podium, you will be able to find the skeletal remains of Drokt, along with his journal beside him. From reading his journal, you can deduce that he became obsessed with the Oculory, but died without successfully focusing it. Reading it may also aid you in solving the Oculory puzzle during the related quests. Drokt carries exactly 18 gold, three pieces of charcoal, a roll of paper, a sample of bone meal, and a steel dagger. Proceed through the door below the focusing controls along a short passage to the lift that will take you back to the surface. Upon reaching the surface, you will find yourself in an enclosed area. Simply activate the lever to the right side of the gate to unlock it; this adds a new marker to your map if you have the Runed Lexicon, allowing you to fast travel to this lift. The lift serves as one of four permanent access points to Blackreach. Outside the lift is an abandoned campsite with two tents. After exiting the lift, immediately to your left is a lit campfire. There is a pot hanging over it containing two pheasant roasts. To the right of the stairs is a table with small and large Dwemer plate metals, a Dwemer plate, and a potato. A knapsack leans against this side of the stairs next to a shovel. Both tents contain unowned bed rolls, and in between the two tents is an unlocked chest. Inside the larger tent lies an empty chest beside a table strewn with various equipment including an iron sword, an iron dagger, a pair of iron gauntlets, a pickaxe, and a saw. Before entering the Tower of Mzark from Blackreach, there is an ebony ore vein to the east, on a small island in the river. Directly under the stone bridge is a crimson nirnroot plant. There is an iron ore vein southwest of the lift on the surface, up the steep slope. Two snowberry plants can be found near the lift, around the abandoned campsite. The Tower of Mzark lift is erroneously marked as being in Hjaalmarch. This page was last modified on 4 April 2019, at 16:04.